What's The Truth Behind Climate Change? What’s The Truth Behind Climate Change? The planet is cooling, despite what the Intergovernmental Panel on Climatic Change (IPCC) has claimed. Ice core samples continually exhibit and prove CO2 isn’t the main driver of climate change. Demonizing CO2 which is what plants need in order to survive? We need plants with plentiful CO2 levels to grow our food, and studies have shown that biomass explodes with heightened CO2 levels. With all of this in mind, it is no surprise that the majority of scientists are skeptical of climate change. CO2 doesn’t lead changes in temperature; temperature leads CO2 levels by at least 800 years of lag. Antarctic ice glaciers are also growing exponentially to the extent they’ve grown an extra 533,000 miles in 2013 compared with the year 2012 during the Antarctic summertime. Much to the surprise of some environmentalists, polar bear populations are also either stabilized or are increasing. Sir Brian Heap, president of the European Academies Science Advisory Council warns the planet will be affected by devastating winter storms of cold for the next 30 years. Some people are convinced that man-made air pollution affects the temperature to some degree. Including claiming livestock are a significant cause. When you look at the numbers closely, our contribution to ‘green-house gases’ is a sliver when compared with what the Earth produces naturally. So even if CO2 influences temperature (which is doesn’t) the way the IPCC claims, we wouldn’t be the problem. This is how minor our contribution to CO2 is compared with the total amount generated organically: Decaying matter – 48.4% Sea life – 48.4% Human contribution – 3.2% The true cause of climate change is the sun. Yes, I understand it may be shocking to consider that the trusty old sun affects planetary temperatures, but bear with me. The planet Mars is rapidly heating up, with its CO2 “ice caps” melting at a very fast pace. Scientists are puzzled as to why Pluto is warming as well, and these are just some examples which include Jupiter and Neptune’s moons. But ah, this didn’t stop the IPCC from releasing a study suggesting our sun plays only a ‘minimal role’ in this planet’s temperature. The sun goes through cycles of heightened activity and lowered activity that relate to its sun spots. The fewer the sun spots, the colder it is, and vice versa. Yet this is never considered in the IPCC’s data. Through the 9th – 13th centuries, there were far warmer temperatures than there are today. What caused this, people’s wooden carts and their horses? Soon after the warm period of 400 years, this planet entered what was called the ‘Little Ice Age’ from the 13th – mid 19th centuries. Organizations like the IPCC claim that some recent years have been the hottest on record, when records only go back to at least the 1880’s. That is a very small time-frame in terms of global temperature changes throughout history. The IPCC has simply taken the temperatures that have been warming since the Little Ice Age (which ended in the 1850’s) and are exploiting the rise in these numbers as though it is human-related. When in reality, the Little Ice Age and all fluctuations in planetary temperature directly correlates with the solar cycle. Forbes confirms these claims in this article, top climate scientists were also told to ‘cover up’ the fact this planet hasn’t warmed in over 15 years at the height of the IPCC’s major study on climate change. If what they were speaking of were true, then how could Vikings grow crops in Greenland over 1000 years ago because of warmer temperatures? They can no longer do this in the region where they used to be able to because of the colder temperature. The sun’s solar field has increased its activity within the last few centuries, yet this information is never factored into the IPCC’s studies. Recently, the sun has hit a ‘pause,’ which has related to the cooling over the last decade. At this point, the world is now cooling, as the scientist Peter Taylor has shown. NASA has also come to the conclusion that CO2 cools the atmosphere, and the ‘greenhouse effect’ that Al Gore touts is nonsense. In fact, 30,000 scientists from around the globe are suing Al Gore for fraud because of his involvement in the climate change lie. In 2009, it was declassified that many climate change scientist discarded the raw data that global warming is based on by the IPCC studies intentionally. You can see how they rationalized this decision. Population control also ties into ‘man-made’ climate change. 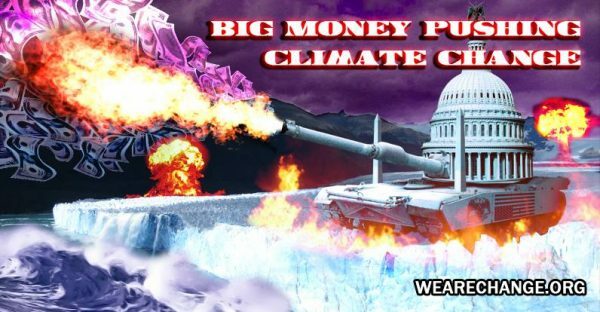 Climate change has already been admitted as a lie and a manufactured threat as far back as the early 1990s by the secretive ‘think tank,’ Club of Rome, in their own documents. Would it be shocking to learn that Al Gore is not only heavily involved with privately-owned carbon trading groups, but is also a member of Club of Rome? What does this mean to you? Does Jorgen Randers advocate a New World Order for illusory climate change? Will carbon-taxes actually help the environment? If they do why is that China is the biggest CO2 emitter yet they do not have to pay carbon taxes?